The five points of pronunciation. This is an "inside" view of the mouth. The person in this image is looking left. The soft palate. The soft palate is the fleshy region at the very back of the mouth. The hard palate. The hard palate is the bony region on the top of the mouth. The area behind the hard bump on the roof of the mouth. This bump sits behind the teeth. The base of the teeth. For each point of pronunciation, we have four stops and one nasal. But for each of the points of pronunciation above, we only learned one stop consonant. How could these other three stop consonants be produced? To start, we could consider whether the consonant is voiced or unvoiced. The letter "b" is voiced, but the letter "p" is not. The distinction between voiced and unvoiced consonants is a real and present part of English, and Sanskrit makes the same distinction. Thus tam and dam are separate words, just like "pail" and "bail" in English. But Sanskrit does make a distinction that English does not. In Sanskrit, it matters whether a consonant is aspirated or unaspirated. Aspirated consonants are breathy and followed by an extra puff of air. (Compare the "g" in "log" to the "g" in "log house.") Native and near-native speakers of English can hear this distinction by comparing the "p" in "spit" — which is identical to the unaspirated Sanskrit sound pa — to the "p" in "pit" — which is identical to the aspirated Sanskrit sound pha. If an English speaker exchanges these two sounds, he can still be understood; but the same is not always true in Sanskrit. 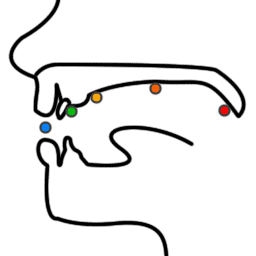 For each of the 5 points of pronunciation, we have 4 stops and 1 nasal. This gives us a total of 25 stops and nasals. The stops and nasals appear in the order listed above. using the voice. g is voiced, but k is not. not voiced. k is unvoiced, but g is not. using an extra puff of air. This part of pronunciation may seem odd, but it occurs in English all the time. The "p" in "pit" is aspirated, but the "p" in "spit" is not. not aspirated. The "p" in "spit" is unaspirated, but the "p" in "pit" is not. This scheme is over 2800 years old. In the next lesson, we will study eight more consonants. These consonants are produced by suppressing the flow of air.